The Orthodox Church tomorrow triumphantly celebrates a day dedicated to our Orthodox Faith itself, for which reason tomorrow is called the “Triumph of Orthodoxy.” The Church celebrates its victory over all its enemies that have, over the millennia, rebelled against it and its teaching. The Church has followed a difficult path, the path of the Cross, a very sorrow and longsuffering path. This path remains so now – especially now. But faithful are the words spoken by the Blessed Good Founder of the Church, when the Apostle Peter – on behalf not only of himself, but of the entire host of Apostles – confessed faith in Him, that He is the Son of the Living God. In response to this apostolic confession, the Lord said that on this faith, on the rock of this confession, He will build His Church and that the gates of Hades – i.e., all infernal efforts, all efforts of the dark forces of Hades – will not prevail against the Church. And these dark forces of Hades fell upon them immediately. In the very earliest times, it was through the unbelieving Jews, the scribes, the Pharisees, and the members of the Sanhedrin – the enemies of Christ. They hoped to suppress Christianity by threats and all manner of harassment, but of course they could not. When they saw that Christianity was spreading and expanding, they understood that they could not defeat it and began in every way to stir up the already dominant, ruling pagan Roman powers to persecute the Church of Christ. These powers fell upon the Church with its mighty state apparatus, by torment and torture. The pagan government used all manner of violence to defeat and destroy Christianity, but it found itself defeated instead. The beginning and the end of the persecutions were especially fierce and terrible. The first persecutions were those of Nero, who ordered Christians crucified and later burned alive; the last persecutions were those of the Emperor Diocletian, who finally, gone completely mad, issued an edict (order), ordering the extermination of all Christians in the state. Soon after him reigned Constantine the Equal-to-the-Apostles, under whom Christianity shone forth as the faith about which the Holy Apostle spoke: this is the victory that overcometh the world, even our faith [1 John 5:4]. True, there were still mad attempts later. There was the attempt of the Emperor Julian the Apostate, who was brought up in the bosom of the Church as a youth, attained the degree of Church Reader, and participated in the divine services. But the great pillar of Orthodoxy, St. Gregory the Theologian, who studied with him in one and the same school, said that he saw even then what evil was growing in the bosom of the Church. An evil that was later directed against the Church itself. “And I wanted to be,” said St. Gregory the Theologian, “a prophet that was mistaken. But alas! I was not mistaken.” The Emperor Julian, when embarking on a campaign against the Persians, also gave an oath that upon his return his would destroy the Christians. But he did not return, for during the battle he was wondrously struck by the heavenly Hand. When the era of persecution had ended, the dark forces of Hades, which had not been calmed, began to attack the Church in another way: heresies appeared. They had existed earlier, during the era of persecution, but they had not especially troubled the Church. But when the first heresy of Arius appeared, then the whole Church rebelled. This heresy, along with the final heresy of iconoclasm, resembled the era of persecution: just as the first and last persecutions were the most severe and evil, so too were the first heresy of Arius and the last heresy of iconoclasm especially long and hard for the Church. It is amazing how tenacious this heresy of Arius was: it was condemned by an Ecumenical Council and was victoriously fought against by Basil the Great, Gregory the Theologian, John Chrysostom, and others, yet despite this it existed, and continued to exist, and to fight with the Church for more than one hundred years. The heresy of iconoclasm likewise troubled the Church long and hard. Finally, when the dogma of the veneration of icons was established at the Seventh Ecumenical Council, it was then decreed to celebrate the Triumph of Orthodoxy on the first Sunday of Great Lent. The Council laid as the foundation of its decision on the holy icons the precise definition of St. Basil the Great who, speaking of prayers before icons and holy images, indicated that the honor rendered to images applies not to the images themselves, as material things, but that this honor and prayer ascend from the image to the prototype, i.e., it ascends from the image to that which is depicted on the holy icon. Thus, the Church established this Triumph of Orthodoxy. We do not know what lies ahead for the Church, but we do know that our time is one in which a new heresy has appeared, one which is called “ecumenism.” As was once said by our Council, the Council of Bishops of the Russian Church Abroad, in the speeches of its bishops and interlocutors, this is the heresy of heresies, the heresy of all heresies, because ecumenists want to unite that which cannot be united, to combine truth with falsehood and to create a harmonious whole. An insane effort! But however appealingly it is put forward in our days, one does not need to examine the matter for long to see immediately how very, very many people have been lured by the temptation of this spiritual counterfeit, this false unity. Beware, Christians! Beware of these temptations in our days! When tomorrow the Rite of Orthodoxy will be celebrated, when in the hearing of all those praying the Protodeacon will proclaim the Symbol of Faith as the common confession of faith of the entire Orthodox Church, and will go on to indicate that “this is the Faith of the Apostles, this is the Faith of the Fathers, this is the Faith of the Orthodox” that has established the world, then check yourselves. The Symbol of Faith contains an accurate and concise summary of our faith. Check yourselves, whether this is what you believe, in every point indicated by the Symbol of Faith. And if you have doubts in anything, if you think differently, then remember that on the points on which your thoughts disagree with the teaching of the Church, you have to deal with them as does the Archangel Michael with the devil on the icon, or as the Great-Martyr George does with the dragon: you need to trample them underfoot and pierce them, mercilessly destroying all such thoughts that oppose the teachings of the Church. Take heed for disagreement with any point of the Church’s teaching. The Founder of the Church said that whoever does not listen to the Church is like a pagan or a publican. 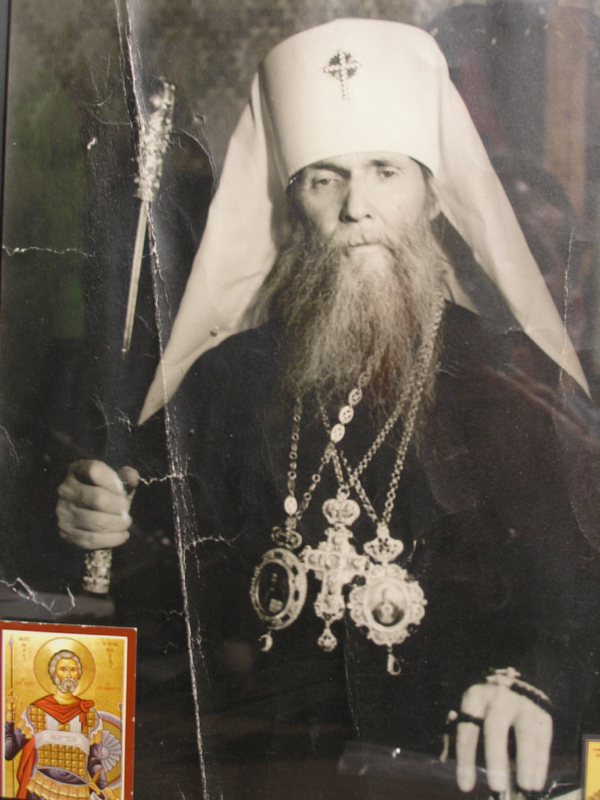 Therefore, if you are wavering in anything, recall that on the day of the Triumph of Orthodoxy you need to pray to the Lord, that the Lord might help you overcome any doubts and to believe decisively in everything that your Mother Church teaches you, in whose bosom you live, and without which you can not be saved, and which is the faithful accomplisher of your salvation. Therefore, I repeat, if doubt has crept in anywhere, pray to the Lord, that the Lord might grant you the strength to be faithful to His Church, faithful to His Orthodoxy. If you are faithful, then there will indeed be a Triumph of Orthodoxy, and your own triumph will be a great and joyful feast for your soul. Amen.